I recently bought a new wheel, kind of by mistake I ended up with a Shimano Ultegra 6700 Tubeless wheel – it was on special offer and discontinued at Wiggle. I didn’t really realising I was buying a tubeless ready wheel, I just saw the 40% off sign! This was a big mistake because it is much harder to fit a tyre and inner tube – even though it is dual compatible. Once I punctured on a ride, and really couldn’t refit the tyre. The first time I put a new inner tube in, but because it was so hard to fit – I got a pinch flat. The second time I needed to repair the puncture, I couldn’t put it back on. I was only saved by a few passing kindly souls who somehow managed to fit it. This was my worst puncture experience, and it made me really regret buying the wheel. After that, I thought if I have a tubeless wheel, I might as well investigate tubeless tyres and see whether it is worth it. Firstly non of the local bike shops seemed to store tubeless – and who can blame them – there’s already a bewildering array of choice. I went online, and spent a long time researching. I was looking for a tubeless tyre with a reputation of not being super difficult to fit. For a while I gave up, but after some research finally bought a tubeless tyre. 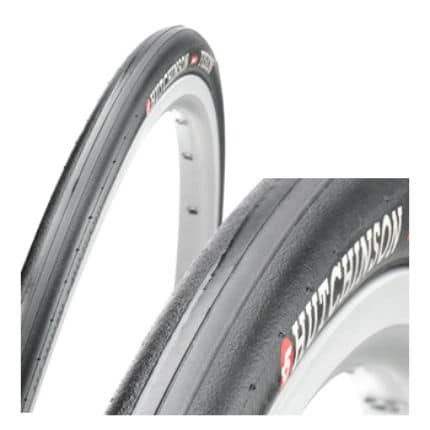 But, after receiving some feedback, I bought a Hutchinson Atom tubeless tyre. 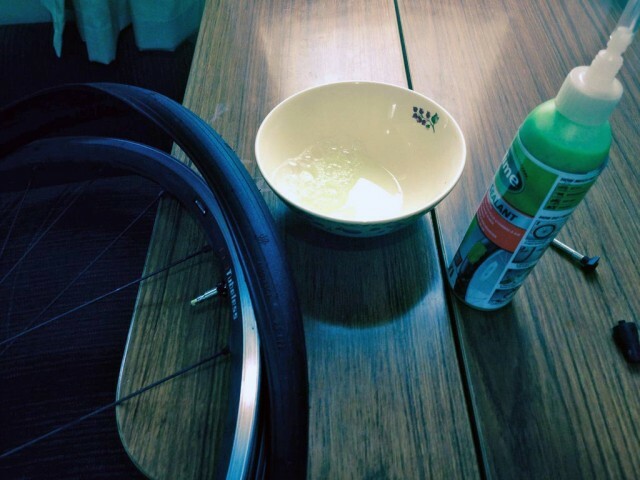 Preparing a tubeless tyre – some soapy water, and sealant. This video was very helpful for fitting my first tubeless tyre. I was pleasantly surprised at how quick it was – much quicker than a tubular, and quicker than a clincher. I did need to use a good track pump to get the tyre to become air-tight. The trick of using lots of soapy water helped. Some tubeless tyres do have a better reputation for being good to fit, like the Scwalbe Ultraremo ZX (Road CC review)- though ironically I couldn’t find any to buy. When putting on, warm soapy water helps get that first air-tight seal. If you struggle you may need to resort to a CO2 cyclinder which can give that quick blast of air necessary to pump it up. I’m using tubeless as a training wheel. I’m also running sealant in the tyre, which adds to the rotating weight. It is not optimised for performance. However, it compares reasonably well in terms of ride quality. I didn’t notice a huge difference with riding standard clincher set up. Tubular are quite similar to tubeless technology in that tubulars can’t get pinch flats either. Tubulars tend to be lighter than tubeless because the rims can be lighter. Like tubeless tubulars require a bit of care and time in putting on. But, they are more manageable. There isn’t a huge difference between tubulars and tubeless. It makes no sense to switch racing wheels to tubeless because of the prohibitive cost – for no real benefit. Also, there is much less choice for top end racing tubeless technology. Also, having got used to tubulars, I would be reluctant to switch. Also, I wouldn’t want to sacrifice the lower weight of tubulars. One advantage of tubeless is that you need to carry less – in the event of a puncture. For tubulars, you have to carry the whole thing. But, for tubeless, you can just carry some inner tube and put in. Just to give a more favourable account of tubeless use (although at times equally frustrating) here are my experiences. I’ve used tubeless on the MTB’s for about 5 years on both tubeless specific rims and ghetto setups (using a split, smaller inner tube) and always with standard tyres (i.e. not tubeless specific) and Stans sealant with no punctures and only one burp of air. Usually running around 20 psi. Makes a HUGE difference and much lower rolling resistance running the much lower pressure on the Peak District’s rocky bridleways. When getting a road bike again a few years ago I was determined to get tubeless on that too when upgrading my wheels and have now been riding tubeless on my summer and winter road bikes for about 2 years. Once again, I’ve never had a puncture on these, note: always use tubeless specific tyres on road bikes due to the high pressures requiring a stronger bead. Tubeless rims have a different profile to them in order to make a better seal for the bead giving them less room to move. In order to get the tyre onto the rim you have to make doubly sure that you push all of the bead of the side you are mounting into the obvious valley in the centre of the rim and mount the section by the valve last of all. If you’ve done that then usually, with any of the tyres, you can get the last bit of tyre on just using your fingers. This would also be the case if you do find yourself needing to put a tube in (although it’s hard to imagine the circumstances when you would). Getting the tyre to inflate and seat on the tyre can, at times, be ridiculously frustrating. With experience you should be able to get it to mount 1st time the majority of the time just using a track pump. My tips would be to put in your sealant then slowly turn the wheel through 360 degrees while shaking the sealant to splash it around the inside of tyre and rim. If having real trouble then dribble a bit of sealant between bead and rim, only had to do that on MTB though. Also, if you’re using rims like Stans then you need to put special rim tape on as the spoke holes are still in the rim. Make sure you put at least 3 full layers of tape on so it can hold 100psi over the holes but it also makes mounting the bead much, much easier. If still struggling then add another layer of tape. As if having not to no worry of getting punctures isn’t enough of an incentive to use tubeless but in my opinion the cornering is noticeably more solid than on clinchers with tubes. Also, if you are riding on heavy/rough roads then running a lower pressure will actually decrease your rolling resistance. GT was running about 72 psi on 27mm tyres for Paris Roubaix although that is obvious a rather extreme example. thanks for detailed comment Ben. I’ll have to look at my psi I often blow up to 120psi whatever conditions! Just curious as to why an article about tubeless tires would be written by someone who hasn’t actually ridden them? I’ve been riding road tubeless for about a year now, and I think the greatest benefit that isn’t really touched on in the article is that, riding tires with sealant, small (and not so small) holes from thorns, glass and other debris seal almost immediately where they would require a tube change for either clinchers or tubulars. With the increased popularity of gravel riding, I think his is a huge boon. I also inadvertently purchased a set of tubeless ready wheels – Easton EC90 RT – as they were 70% off in the Chain Reaction New Year sale. Very easy to fit a standard clincher on unlike the shimano wheels. I’m yet to try them tubeless though – I simply haven’t been able to justify the significant extra expense of tubeless tyres and sealant over the vittoria open corsa’s that I already know to be excellent. Just needing some advice on a silly question on tubeless tyres. I use them on my roadie. It then it seemed to start hissing again when i got back on the saddle a couple of times but then stopped as i continued to ride. 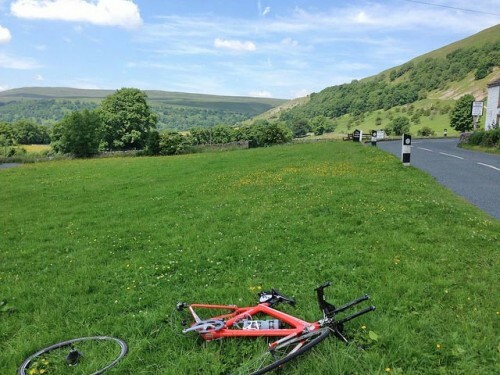 1) what are you actually meant to do when you get a puncture? keep riding and hope for the best? stopped and try and find the hole and put finger over so the sealant sort of stays there?? 2) secondly, if you get home without having to fix the tyre do you need to patch it from the inside or has the latex effectively sorted it permanently?? thanks guys and Ben Lowe really useful info there too! Keep pedalling as long as you have enough air. Once sealed stop and re-inflate if you need to. Try and use a hand pump. CO2 freezes the stans fluid and creates fur balls. I found the review and various comments helpful. As a roadie, I do not need the low PSI advantage and find the “frustrations” involved as an unnecessary distraction from what I enjoy, to where it would discourage me. I would rather have increased risk for flats with the simplicity of repair. I find it offensive that the road industry is trying to push this tech on set up of bikes. I know few who ride tubeless but of those who do, they do speak highly of them. I do live in high thorn country so I may reconsider this position over time. However I find you buy a decent tire AND replace it timely vs wearing it down, then flats are infrequent. Pinch flats at 95%, who came up with that? High in MTB but not road so again that factor is irrelevant. It is the thorn protection of interest with sealant but could get that in other ways if chose to go that direction or even a liner. My training tires with thicker tread do fine. Anyway-the road industry needs to chill on shoving this tech on us (same with disc brakes) until more are wanting it. I will order my new bike without the tubeless, no disc, and probably no compact (although the compact would be of interest if had not been so engrained on standard set up).